The post Is Your Dog Eating Poop? It’s Called Coprophagia and Here’s How to Fix It by Sara Reusche appeared first on Dogster. Copying over entire articles infringes on copyright laws. You may not be aware of it, but all of these articles were assigned, contracted and paid for, so they aren’t considered public domain. However, we appreciate that you like the article and would love it if you continued sharing just the first paragraph of an article, then linking out to the rest of the piece on Dogster.com. Is your dog eating poop? Well, there’s a scientific name for a dog eating poop — coprophagia. I first noticed something was amiss when Mischief, my youngest dog, didn’t come in after her last potty break of the night. When I called her, she took a couple quick, habitual steps in my direction, then darted back to swallow something in the snow before running in. My suspicions about her out-of-character behavior were confirmed at 3 a.m., when she woke me out of a sound sleep by vomiting up three large puddles of … poop. I’ll spare you the details of my early morning clean-up, other than to say that I left a window cracked for a couple hours, heating bills be damned. Instead, let’s skip over that awful night and speak of more constructive things. Namely: Is your dog eating poop? Why do dogs eat poop, and how can we stop coprophagia in its tracks? First, why do dogs eat poop? Why in the world do dogs eat their poop and what can you do to stop it? Photography by ©LeoPatrizi | Getty Images. Is your dog eating poop? It’s not as weird as you think. While coprophagia is disgusting to us, it is a normal behavior for dogs. Some experts theorize that this behavior is the root of domestication. Wild canids would eat human refuse outside of settlements, and over time these animals came to resemble our domestic dogs more and more. Mother dogs eat their puppies’ excrement until the pups are about four weeks. Dogs like poop, and their digestive systems are designed in such a way that they can often gain nutrition from the waste products of other animals. All that said, a dog eating poop is not a behavior most of us will tolerate in our companion dogs. 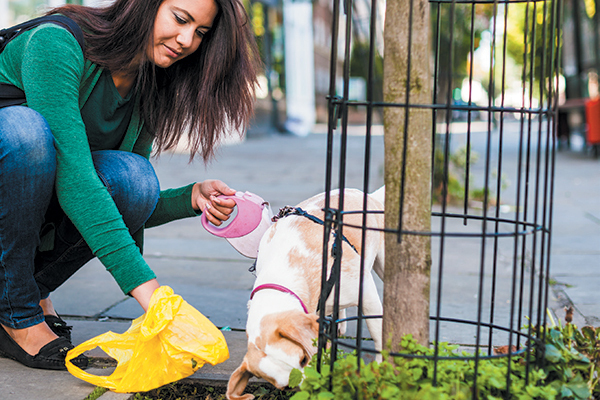 There are some health risks to a dog eating poop, such as an increased risk of parasites (some of which are zoonotic, which means that people can get them, too). If your dog has allergies, as one of mine does, the undigested remnants of allergens in the poop of animals fed certain diets can trigger an allergic reaction. As soon as I realized what Mischief was up to, I sprang into action. There are two important aspects to any treatment plan dealing with a dog eating poop: management and training. Let’s start with management. The more your dog practices any behavior, be it a dog eating poop or sitting politely to greet guests, the better the dog gets at that behavior. For a dog eating poop, this means preventing him from “practicing” that poop-eating behavior is of vital importance. There are several ways to do this. One of the first things I did was to thoroughly clean my yard. This was difficult, as nearly a foot of freshly fallen snow meant it was difficult for me to find old piles, but easy for Mischief with her talented canine sense of smell. I resolved to pick up each new pile as soon as it happened. Since there were still likely to be some dog poop hidden under the fresh snow, I also needed a way to prevent Mischief from gobbling up anything new she found. For this purpose, I conditioned her to happily wear a muzzle. Management in place, I could get down to training to stop the coprophagia. While there are several food additives on the market that claim to make the dog’s poop unappetizing, these options were not available to me due to Layla’s severe allergies. If you go this route, it’s important to treat every dog in the household, or the offending dog will learn to just keep trying in order to find an unadulterated pile to munch on. These additives are not completely effective, although they can work for some dogs. A dog eating poop is undoubtedly disgusting, but like all other behavior problems, it can be solved. And as anyone who has ever had to clean up a mess of the sort Mischief presented me with the other night can attest, it’s well worth the effort to coprophagia in its tracks. If you need little extra help solving a tough coprophagia problem with your dog, don’t be afraid to call in an expert. I frequently help families with this issue through private consultations. Tell us: Is your dog eating poop? Share your tips and stories about coprophagia in the comments!